Overlapping full and quarter dials with color circular bars that warp around the edge. Individual Large and Small 3D dials with user defined labels. Perimeter needles rotate clockwise. Vertical and Horizontal Bar graphs are also available. 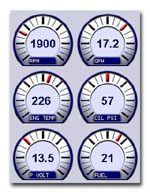 Individual Large and Small dials with user defined labels on white background. Centered needles rotate clockwise. Vertical and Horizontal Bar graphs are also available. Individual Large and Small dials with user defined labels on white background. Perimeter needles rotate clockwise. Dials change color at maximum. Vertical and Horizontal Bar graphs are also available.